I served them in a sage Parmesan cheese sauce, alongside brandy flamed duck sausage. Come see how to make them, they are worth the effort. First, boil your potatoes in their jackets. The theory is that they absorb less water that way. Peel them while still hot. You can almost rub the skins off with a paper towel or the blunt edge of a table knife. Mash the potatoes, or run them through a food mill or potato ricer. Turn out on the counter to cool and dry out a little. You'll need to get 1/4 cup of a beaten egg, that will be one large egg and almost a cup of flour. In the mound of potatoes you want to add the egg (it's there under the flour) and start sprinkling on the flour. I started with 1/4 cup. Using a bench scraper, or your hands, fold the potaoto over on it's self to mix in the egg and flour. Add the flour little by little and gently knead the flour into the potato until you have somthing that starts to feel like a pie dough. I wanted to only add as much flour as I needed to give the dough enough body to roll off the back of a fork so I could have gnocchi with grooves. So, test as you go along, add some flour and test rolling a little piece along the back of a fork. If it doesn't hold it's shape, have gooves and a little cup on one side, it's too soft so knead in a little more flour and test again. Once the dough is the propper consistency roll into snake like logs, about the thickness of your finger. Using a knife or bench scraper, cut the logs into pieces, about every 3/4 inch. Place a piece of gnocchi on the back tines of a fork, and with your finger, starting at the top of the fork, apply light pressure and roll the gnocchi down the length of the fork. Drop the little lovelies into salted boiling water. When they float to the top they are done. They are pretty sticky so I quickly drained them and placed on parchment paper while I cooked the rest. If you want to eat them right away, you need to make some kind of sauce. A quick brown butter sauce would be great. 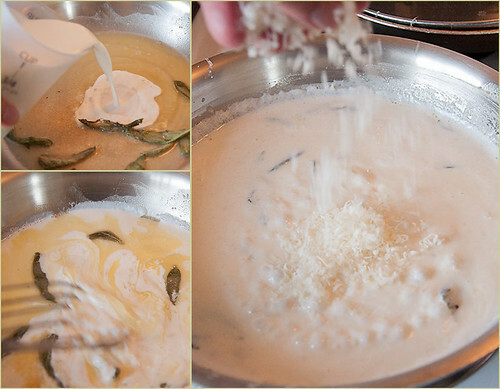 I decided to make a cream sauce with some sage and parmesan cheese. Pretend you see some cheese in there too. Basically start making a sauce with 2 tablespoons of butter; or fat of your choice, and 1 tablespoon of flour. 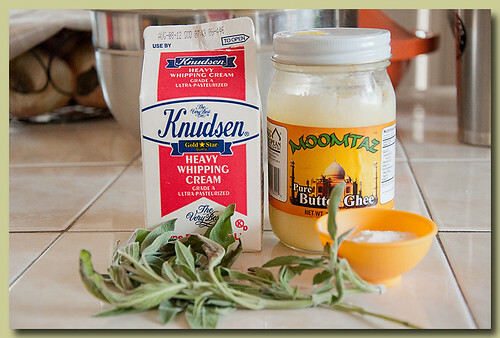 Melt the butter in a skillet and whisk in the flour and add a few leaves of sage. Cook a few minutes, watching it closely so the flour doesn't get too dark or burn. 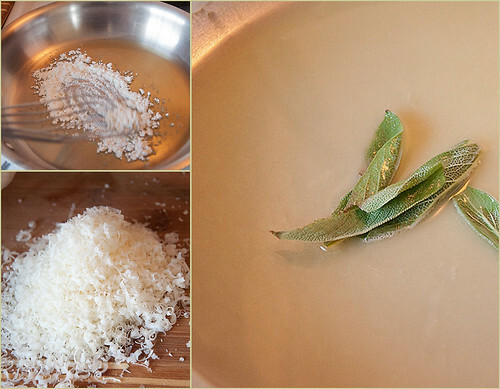 While the flour is cooking take the opportunity to grate some Parmesan cheese. Add 1 cup of heavy cream and whisk, whisk. Then add Parmesan cheese to taste. 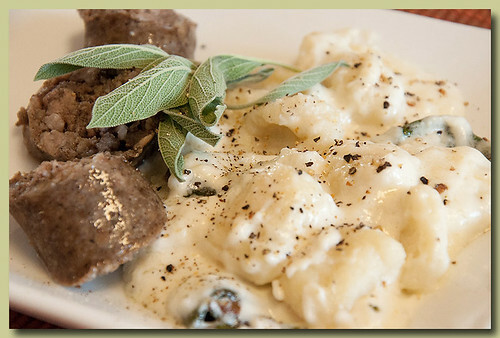 You now have a nice rich, creamy, flavorful sauce in which to bathe your gnocchi. 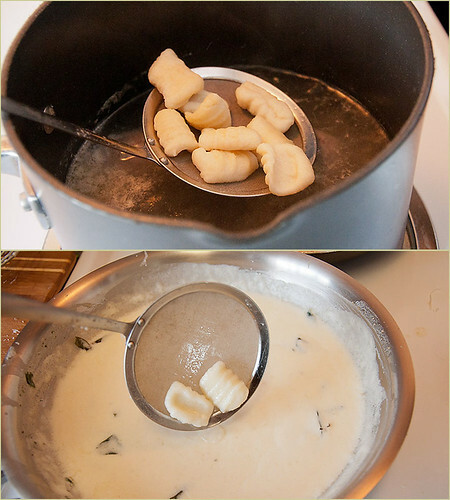 If you made your gnocchi in advance, just plunge them in boiling water for a few minutes and add to the sauce. This could be the main meal or a wonderful side dish. until tender throughout, this takes roughly 40-50 minutes. Remove the potatoes from the water one at a time with a slotted spoon. 3/4-inch (see photo). Dust with a bit more flour. practice, don't get discouraged, once you get the hang of it it's easy. batches by dropping them into the boiling water roughly twenty at a time. family-style with a drizzle of good olive oil on top. mill on hand, but said that mashing the potatoes by hand would be fine. to cook the gnocchi - no problems.